The Dive from Clausen's Pier reminds us how fragile our lives are and how quickly they can be divided into before and after. It begins with a disaster that could happen in anybody's life, and leaves us to asking what we know about our deepest allegiances. Elegantly written and ferociously paced, emotionally nuanced and morally complex, The Dive from Clausen's Pier marks the emergence of a prodigiously gifted new novelist. ©2002 Ann Packer (P)2002 Random House, Inc. Random House Audio, a division of Random House, Inc. If you could sum up The Dive from Clausen's Pier in three words, what would they be? What does Scarlett Johansson bring to the story that you wouldn’t experience if you just read the book? I felt like her voice perfectly fit the character. You could hear the indecision and uncertainty as she dealt with this new path in her life. I probably would not have read/listened to this book if I hadn't been pulled in by curiosity regarding the narrator. However, I'm so glad I was. I loved this story. It pulled me right in, I felt like it was floating through her life. I felt every pang of worry, guilt, heartache, panic, anxiety, love - all of it. It was wonderful and I was sad when it was over. Scarlett Johansson did a wonderful job. I found the events and characters in the story quite intrigueing. But not fascinating. I don't know if it's suppose to be done that way but I did find the narrator Scarlett Johansen a bit flat. I felt she could have put more enthusiasm and oomph into the story. I was also disappointed by the ending because if I was the author I would have ended the story differently. This story was decent. Nothing special. The story was a mediocre one. It was special in the beginning, but went nowhere the rest of the book. Moreoever, the narrator's voice was annoying. She sounded bored just reading it. I know this was a best-seller, but I was not impressed. I made the mistake of buying the abridged version of this book, so didn't care for it much. However, I think if I had read the longer version, I might have slit my wrists. This girl is really annoying. She doesn't know what she wants or who she wants and just glides through life. You just want to smack her. The performance of Scarlett Johansson is awesome ! The narration take me to other world, sometimes touching and others funny, very complete! I expected more from the story. Starts well, but fizzles out at the end, with an unrealistic finish which doesn't seem to fit the rest ofvthe story. Good narrator. What made the experience of listening to The Dive from Clausen's Pier the most enjoyable? Very descriptive. Felt like I knew the characters, even if I didn't like them or what they were thinking. A decent book, not a great one, but good enough. I listened to this, then several months later read it for my book group. Both times I found it enjoyable but not great. However, my own son is leaving Wisconsin soon to go to school in New York City, so I find myself recalling bits of the main character's life there -- you never know when something you read in the past will become significant. Scarlett has a truly unique voice. 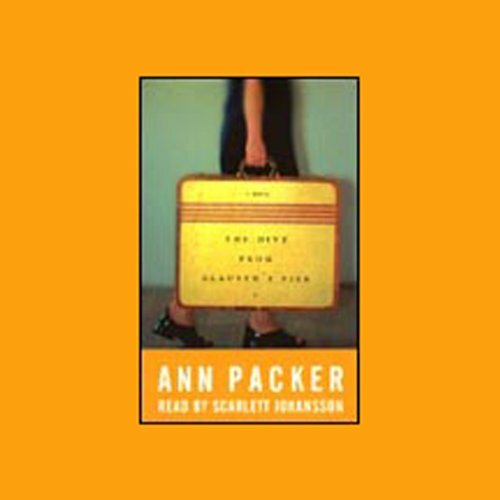 This gift and her natural talent give a lot to a searing situation and storyline which is marvelously offered to us by Ann Packer. not to be missed.